Donald Trump, a scabies outbreak in your freshman dormitory, has done very little to prepare for a win—like running ads or get-out-the-vote operations, for example, or learning which U.S. president invaded Afghanistan—but he has done quite a bit to prepare for his loss, recently telling CNBC that he would take a “nice long vacation” if Clinton prevails, and, more troublingly, informing his supporters with clairvoyant gusto that his opponent will commit election fraud (a nearly impossible feat). At a Pennsylvania event on Friday, Trump claimed that if Pennsylvania goes to Clinton, it will be because “certain areas” of the state cheated on her behalf; earlier in August, Trump began priming his supporters in the concept of a “rigged” election, a suggestion that threatens to corrode the functionality of our political system. This assertion also “channels a conviction that has deep roots in our culture: A woman could never really win, not over a man,” Rebecca Traister wrote for New York Magazine last week. And it’s not only women who are cheaters; “certain areas,” the LA Times has pointed out, is very clearly a coded nod towards minority populations. In Sunday’s episode of Last Week Tonight, John Oliver noted that Pennsylvania is polling for Clinton and has gone to a Democratic candidate since 1988—but no matter! 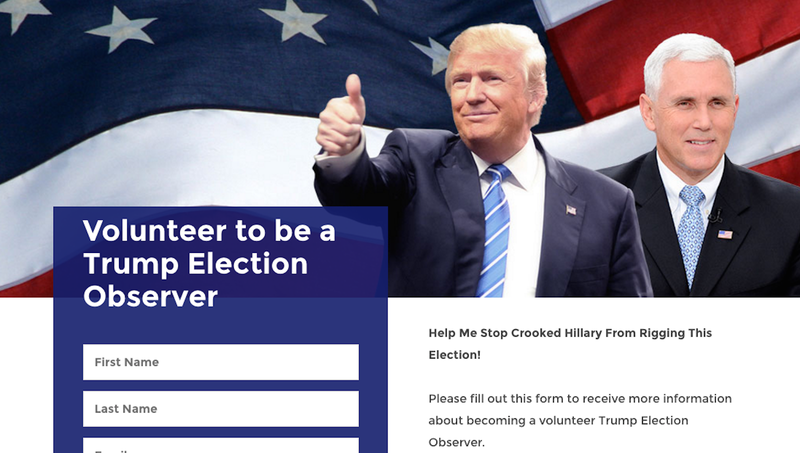 Trump has encouraged his supporters to become “Trump Election Observers,” a concept no less scary than it sounds.